THE MINISTER FOR State at the Department of Health Alex White said that public support for alcohol policies will be enhanced when people realise the impact alcohol has on the family, the workplace, and society as a whole. Speaking today at the Alcohol Forum National Conference, which emphasised the harmful affects alcohol has on others. White said that there was a turning point in support for tobacco control policies when people recognised the damage caused to others by passive smoking, adding he hoped it would be the same for alcohol awareness. Health labelling of alcohol products. 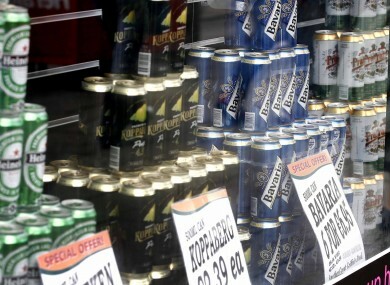 He added that the North/South research on minimum unit pricing will be completed by June 2014. The study is modelling the impact of various minimum unit prices on consumption of alcohol. “Our alcohol problem is significant and we need decisive and innovative action to address it. The overall objective is to reduce Irish consumption of alcohol from 12 litres of pure alcohol per person per year to 9.2 litres – the OECD average – by 2020,” he said. As part of the public dialogue surrounding the Bill, many of us in this room have been accused of treating the drinks industry like a ‘pariah’. This is certainly not my intention.The drinks industry has a job to do which is to sell alcohol and maximise shareholder interests. They are perfectly entitled to do this. As large employers they have a role in our recovering economy. The drinks lobby advocates the industry’s business interests vigorously and I have no objection to that. … the conflicting interests of the drinks industry who seek to increase the consumption of alcohol and public health professionals who seek to reduce the consumption of alcohol really cannot be reconciled when it comes to formulating public health policy. The alcohol industry seeks a role for itself in public health policy areas that extend far beyond their role as producers and retailers of alcohol. He concluded by saying, “the time has come to act. We should try to proceed by consensus as far as we can. But to be effective we will have to be radical”. Email “'It's not my intention to treat the drinks industry like a pariah' says Alex White ”. Feedback on “'It's not my intention to treat the drinks industry like a pariah' says Alex White ”.